Receive 2 FREE tip sheets now! 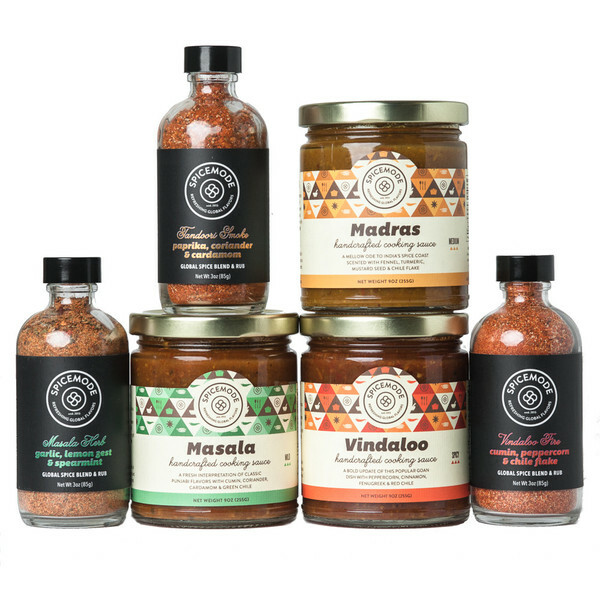 Yes, I adore anything healthy, gluten-free and paleo but when I found this Indian company’s spices and sauces, I considered my hunt to have come to an end. The amazing Spicemode is just that, amazing. My time in the kitchen is freed up to create my meals and dishes without pulling out a ton of spices, plus the taste is truly divine and beyond my expectations. For me to eat the sauces by the spoonful says it all. These are rich, deep, bold and truly Indian at heart. These are truly the starting point for a meal to be packed with flavor, and the gluten-free and paleo meal possibilities are endless. The amazing Spicemode founder, Amar Singh started out in the very popular Curry Cruiser truck in the heart of Chicago. Long story short, why not bring these very popular spices to our front doors. I am one to admit I am extremely happy he made this choice. He’s created products that help give home cooks of all skill levels an approachable and easy way to experience flavorful ethnic food. Amar likes fresh ingredients as much as we do, so each Spicemode product is made with real, fresh and whole ingredients. 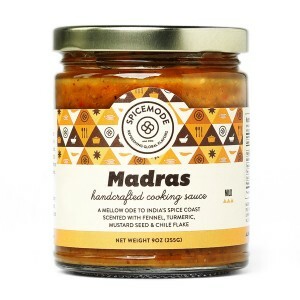 Their aromatics are locally sourced from Midwestern farms, freshly chopped in-house, and then made into the perfect base for only small-batch sauces and without preservatives. Spicemode’s artisanal production method takes time. They let the flavors “ripen” over time. Their recipes begin with sweetly-caramelized onions and a blend of freshly minced garlic, ginger and chiles. The mixtures cook slowly in kettles before finishing with a hand-tailored blend of spices and chili powders. So what are my favorites? Oh jeez! 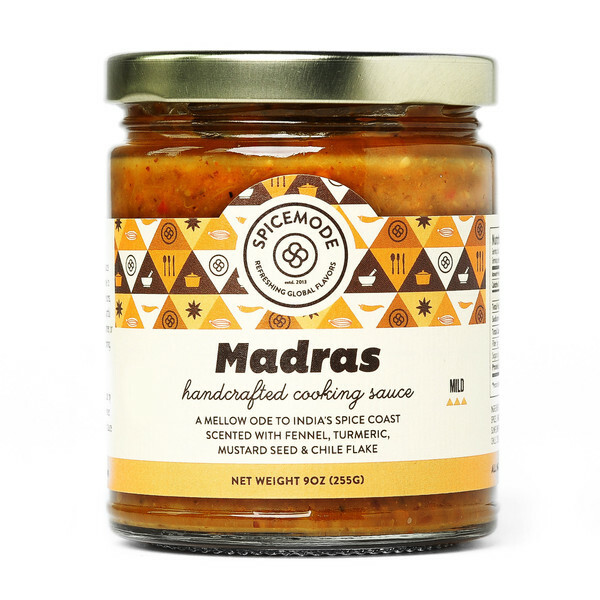 The option to buy a three pack with the Vindaloo, Masala and Madras spices at such a good price is really an incredible deal, and the flavors are so bold that a little goes a long way. No complicated recipes are needed as the flavors enhance any dish. I am a little partial to the Vindaloo and Masala personally. Yes, those two I could not stop eating by the jar. It felt so healthy for my body! 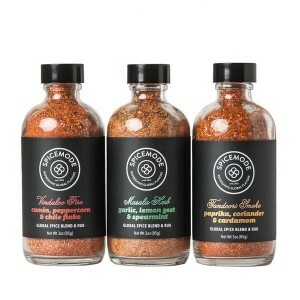 The jars of the Seasoning Collection come in a pack I think I will buy next and probably purchase as gifts for friends too. With all this said, I really cannot say enough about these products. My only suggestion is that if you are expecting your order quickly be sure that Amar has your order ready to go out the door, as the batches are handmade and he mentioned that sometimes (not often) the order may be delayed. You can email via his website or when placing your order. It is all extremely simple. Enjoy – I sure did! If you’re into new and Omazing products like I am, be sure to also enter my latest PaleOmazing giveaway. I'm a cookbook-collecting, recipe-developing paleo junkie, and I live in the kitchen. I'm hooked on farmers' markets, traveling, eating healthy, and hiking until my legs scream at me. There's nothing better than hanging out with family and good friends. I have fun and sleeping is just plain boring. Read more About Tina Turbin. This looks and sounds absolutely delicious! Thank you for your post. Do you know where I can get these online? The point of the Paleo diet is, and I feel some people forget this, to not only diet, but to eat delicious foods at the same time. It’s the only diet I’ve come across that cuts out food groups, yet still focusses on everyone’s need to eat great food. 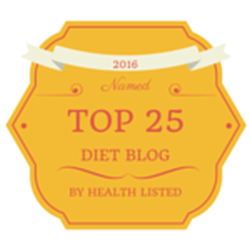 I’m a real foodie, and would not survive on any other diet, but Paleo has been very good for me. I'm a cookbook-collecting, recipe-developing junkie, and I live in the kitchen. I’m hooked on farmers’ markets, traveling... Read more About Tina Turbin. Copyright © 2004 - 2014 PaleOmazing.com is a registered Trademark owned by TTAT. ALL RIGHTS RESERVED Any unauthorized copying, translation, duplication, importation or distribution, in whole or in part, by any means, including digital and electronic copying, storage or transmission, is a violation of applicable laws. The views and opinions expressed on this blog are simply the blog owners. If we claim or appear to be experts on a certain topic or product or service area, we will only endorse products or services that we believe, based on our expertise or opinion that are worthy of such endorsement. Any product claim, statistic, quote or other representation about a product or service should be verified with the manufacturer or provider always, and your own discretion . This blog accepts free manufacturers samples and possibly forms of cash advertising, sponsorship, paid insertions or other forms of compensation. Should compensation ever be received, this will never influence the content, topics or posts made in this blog. all content on PaleOmazing.com is licensed and the original creation and property of PaleOmazing.com or Tina Turbin (unless otherwise noted). you may use photos from PaleOmazing.com only as long as their usage adheres to the following license criteria: (i) the photo is to be credited to PaleOmazing.com, and such credit is to be placed directly under the photo with the text "photo provided courtesy of PaleOmazing.com," the photo and the text "PaleOmazing.com" must be linked back to http://www.PaleOmazing.com/ (ii) you may not use any photos for commercial purposes. (iii) You may not alter, transform, or build upon any photos. you may use recipes from PaleOmazing.com only as long as their usage adheres to the following license criteria: (i) the recipe is to be credited to PaleOmazing.com; such credit is to be linked back to the original recipe at http://www.PaleOmazing.com/ (ii) you may not use any recipes for commercial purposes.